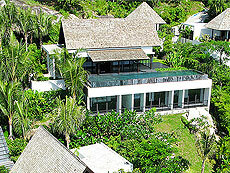 Villa Yang is located at same property as sister villa Villa Yin at Kamala cape west coast of Phuket. The villa have 4 bedrooms and most of rooms in villa could see wonderful sea view of Andaman Sea. In the villa decorated soft-lined Thai design mixed with hard-lined modern design that is very fashionable but harmonize with Phuket stay. The villa also easy access to the other spot that 20 minutes ride to the Patong beach where famous spot for tourist and 35 minutes to Phuket airport.